No, the Philippines did not sacrifice human rights in the altar of free trade. 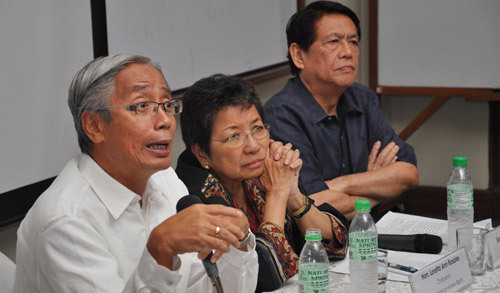 This was the answer of Sen. Wigberto Tañada, Chairman of the Philippine Working Group for an ASEAN Human Rights Mechanism, to the question asked of speakers at a forum on Thursday, 26 May 2011. Free trade policies have a remarkable capacity to widen human rights, fundamental freedoms and even advance women’s rights. However, these policies can also undermine the fundamental principles in the Universal Declaration of Human Rights and national constitution that uphold dignity and social progress. Free trade may impair, undermine and place at risk equality before the law and having equal access to public services without discrimination. Sen. Tañada also argued that the Philippines was not prepared when it joined the World Trade Organization in 1994. The promised safety nets and expected gains, including benefits and jobs, did not materialize. Today, the Philippines continues to face deepening poverty, increasing inequality, rising unemployment and a decline of industries and the agricultural sector. Prof. Felipe Medalla of the Foundation for Economic Freedom said that in some countries, the only way for free trade to exist is to violate human rights, by preventing union bargaining, for example. The Philippines, however, is a different case. The reduction of trade barriers came together with democracy and human rights, particularly because artificial trade barriers existed during martial law. Prof. Medalla noted that there are plenty reasons why poverty exists in the Philippines or why human rights may not be upheld but the roots of these are deep and due to terrible institutions, particularly the justice system. He added that the solutions to this problem should be the improvement of tax collection, providing value for money for taxpayers, ensuring judges with fair decisions, making sure that policemen are not criminals themselves and improving the educational system. Hon. Loretta Rosales, Chairperson of the Commission on Human Rights, proposed strengthening regional ties within Southeast Asia as ASEAN members. Previously, regional trade agreements have not allowed this to happen. However, having national human rights institutions come together to discuss critical human rights and trade issues will materialize in collective regional strength to leverage against more developed countries. 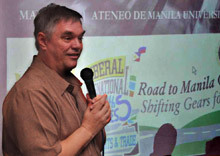 This forum was organized by the Friedrich Naumann Foundation for Liberty (FNF) and Council of Asian Liberals and Democrats (CALD) together with the Ateneo Human Rights Center (AHRC) as part of the "Road to Manila Congress", a series of forums in preparation for the Liberal International 57th Congress on Human Rights and Trade. The next forum, “Saving Asian Democracy: Can the Philippines Lead the Way?”, will bring together journalist Ms. Maria Ressa, Dr. Neric Acosta (CALD Secretary General) and Dr. Rainer Adam (FNF Regional Director for Southeast and East Asia) on Wednesday, 01 June 2011, 4-6pm at the De La Salle University. For more information, please contact Pauline Sanchez at 0920-9158428. Did the Phil. Sacrifice Human Rights in the Altar of Free Trade?